Set in Baltimore in 1962, Tracey Turnblad is a big girl with a big heart, big dreams and even bigger hair. Tracey (with her best friend, Penny, in tow) cuts school one afternoon to audition to be a dancer on The Corny Collins Show, her favourite daytime TV programme. Despite the best efforts of Velma Von Tussel, the show’s producer, Tracey is chosen to be the new dancer; but when Tracey learns that her black friends aren’t allowed to dance with the white kids on the show, she sets out to change things once and for all. But can Tracey unite black and white on TV, win the hand of her heartthrob and fellow dancer, Link Larkin, and walk away with the Miss Teenage Hairspray Pageant crown? 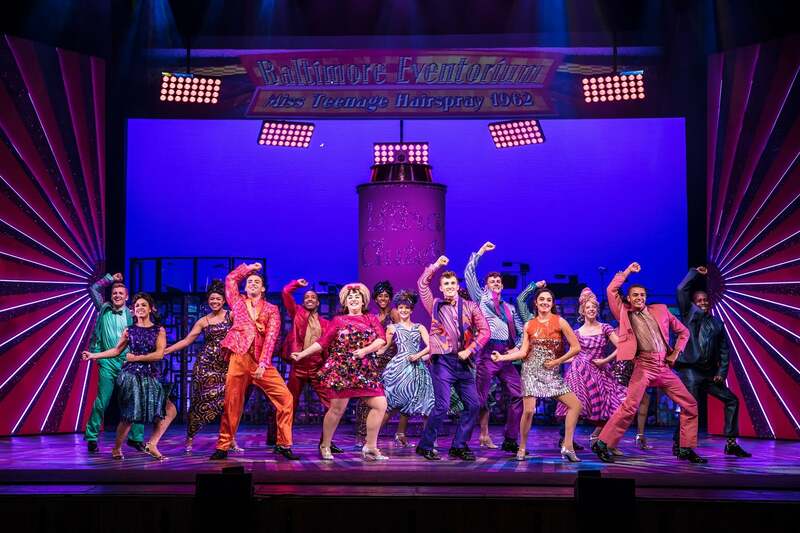 Based on the 1988 John Walters film, this is a colourful and energetic production which ups the camp value and fun factor to create a feel good, crowd pleasing musical with a strong underlying message about social inequality. Matt Rixon pleases as Edna Turnblad, and bounces nicely off Norman Pace as Wilbur; whilst Brenda Edwards (X-Factor) belts out the tunes as Motormouth Maybelle and manages to nail her big number with ease. Rebecca Mendoza makes her professional debut as Tracey Turnblad, and despite some unnecessary gurning and an overly squeaky American accent, gives a competent performance, although one which would have showed her talents far better if her direction was reined in slightly, allowing the role to be played with a straight bat. The remaining cast provided for a spectacular ensemble, filling the stage to the brim in the musical numbers, and bringing with them an infectious enthusiasm. Featuring the songs You Can’t Stop The Beat, Good Morning Baltimore, Welcome to the 60’s and I Know Where I’ve Been, the numbers come thick and fast, and are catchy, upbeat and instantly likeable. The dance routines are full of energy and ensure that there is always plenty to look on the stage, whilst the lighting and costume designs flood the stage with colour, adding to the pop-bubblegum feel of the piece. Utterly engaging and utterly enjoyable, Hairspray is a musical treat which is so much fun that you will find it hard resist its charms. Hairspray is at the Sheffield Lyceum until Saturday 3rd February 2018. Visit www.sheffieldtheatres.co.uk for tickets and details.